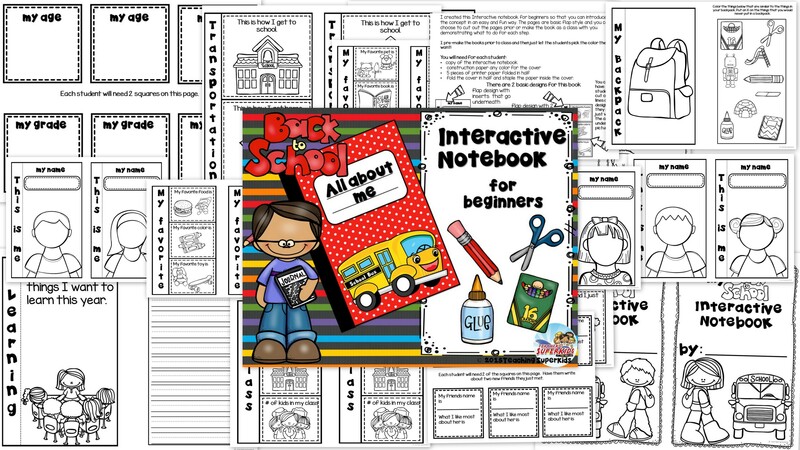 Interactive notebooks are all the rage it seems but often times it is hard to know where to begin especially with young children many who are still in the early learning stages of cutting/gluing and writing. I had a special request to make an interactive notebook for 1st graders and got to thinking what if they haven’t ever done one before? How can I make it easier for them especially at the beginning of the year when it can be so overwhelming for both students and teachers? I think interactive notebooks are a fun and creative way to practice daily skills and help to solidify new skills introduced. Students always have access to it and it makes a great reference tool. It really allows for students to take complete ownership of their own work. They can help engage students and they will be more apt to retain the information. My goal was to create something that you can use to determine if Interactive Notebooking will be a good fit for your class. What is great about this is that you won’t need to waste a composition notebook because you create it out of construction paper and printer paper. It is a perfect Back to School activity! The notebook itself has 2 very easy flap styles! Fold the Construction paper cover. Then fold the printer paper in half place inside the cover and staple along the side. You can put tape on the back part of the staple to prevent little injuries. I would pre-make the books and just allow students to pick their favorite color. Let them pick the cover (4 options) and get started. If you would like to download a copy of the Interactive Notebook click the picture below! I hope that you and your students will enjoy! This is great! I am so excited to use this!